Jenga is a challenging game, requiring both a steady hand and the ability to plan ahead. Or, if you just don’t have either of those things, a Jenga gun. The Jenga pistol was hand-made by Matthias Wandel, and it’s so powerful that you can shoot a block out even if it is the only block on a level. We doubt the Jenga pistol would be acceptable if you were to pull out the official game rules, but something tells us that you would have having too much fun shooting blocks across the room to pay much attention to the rules. Watch the fun video above to see the almost-intolerably cool Jenga pistol in action. 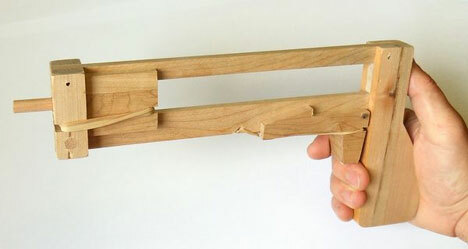 Wandel no longer makes and sells the Jenga pistol, but you can find free plans for it on his site so you can make your own.